Following case study discusses how TransPacific Software built a customised production module on PHP’s CodeIgniter open source platform for bespoke jewelry making . FourMine is a Jewelry and Diamond e-commerce company founded in 1981 in New York, USA. FourMine sells custom built diamond engagement rings, wedding bands and gemstone jewelry online. Fourmine is growing at breakneck speed and with growth there comes new challenges. The major Pain area was efficiently managing production of hundreds of custom build jewelry orders. The quality standards had to be maintained and delivery dates to be kept. For the production of custom jewelry orders, coordination between various stakeholders like Diamond Suppliers, Setters, Engravers, Shipping companies etc. is pivotal. And coordinating with these stakeholders and tracking their order status manually was becoming cumbersome. To overcome this challenge, Fourmine decided to have state of the art software system and approached TransPacific Software for a software solution. TransPacific Software team had multiple meetings with client to understand full process flow and how best they develop a simple but efficient production manufacturing and shipping ERP module. The ERP module was called “Fourmine Intranet”. This case study focuses on structure, the function of Intranet order management system, challenges our team faced and value additions we have delivered. Client needed modules in the backend to manage orders and track the status of various stakeholders like diamond/gemstone suppliers, shipping agencies, setters, engravers etc. As shown in above flow chart, all the entities like setter, customer, appraiser, supplier are managed and controlled via common platform. Thus, effective management of production of hundreds of custom build jewelry orders. 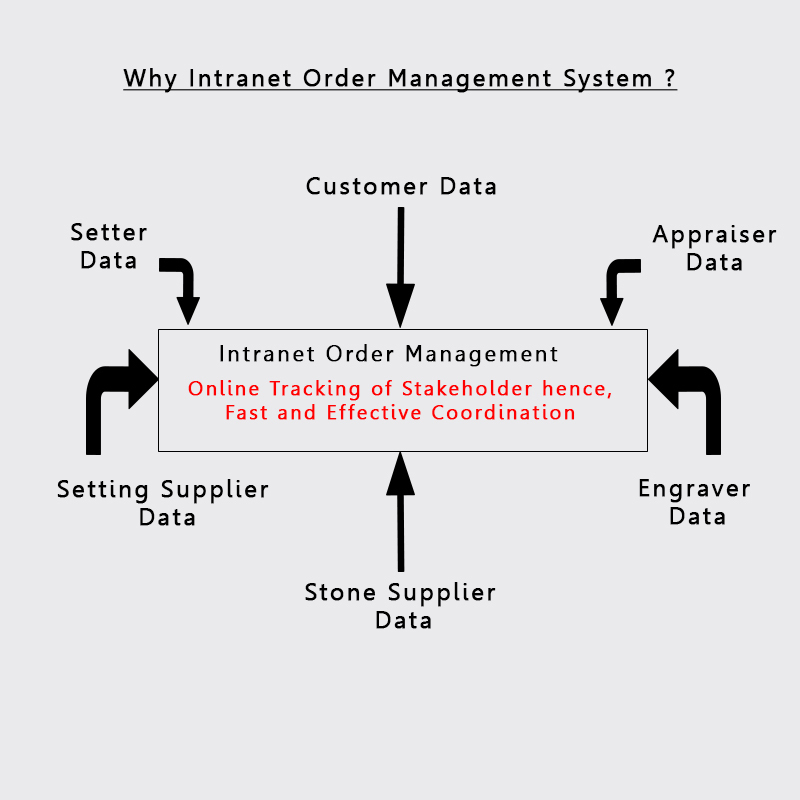 The below image showcases the overview of order management system for Fourmine. Function of each module is given briefly in the following image. Let us take an example of Diamond Ring order. In this case, let us assume setting of a ring is ordered to a particular setter. 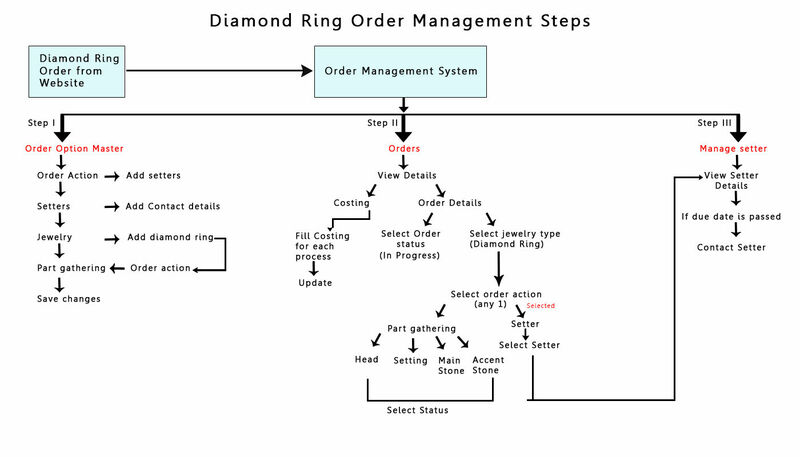 The order gets managed through various steps which are shown in the flowchart below. Like setter as mentioned in above flowchart, all the other team members including engravers, diamond suppliers, shipping agents are managed and coordinated efficiently . In production process tracking could be done on hourly bases to weed off any delays . Comptoir 62 La Fayette(3DCastWax) wanted a user friendly, interactive website which will enable users to purchase 3D printed wax models of various jewelry product categories. Also, 3D wax model has to be rendered using STL format files. As the Fourmine has its website in Magento there was a need for both system (i.e. Magento and Jewelry module) to efficiently talk to each other. 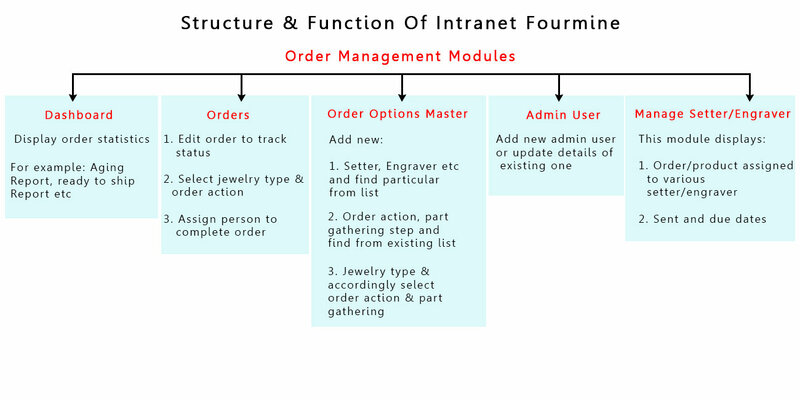 For example, when a sale order is registered in Magento front end website it should be auto-pushed into Jewelry Production module for further backend operations. Further production status on daily based eg. in production /in shipping etc was to be pushed back to Magento so a user through my account could see the latest status of its order. There are two types of API available in Magento, SOAP and REST API. In Fourmine intranet, SOAP API has been used to fetch data from Magento to CodeIgniter framework. SOAP API is secure as well as fast to retrieve and update data in Magento. It’s secure as it’s authenticated by username and password every time when API call has been made to retrieve order data. 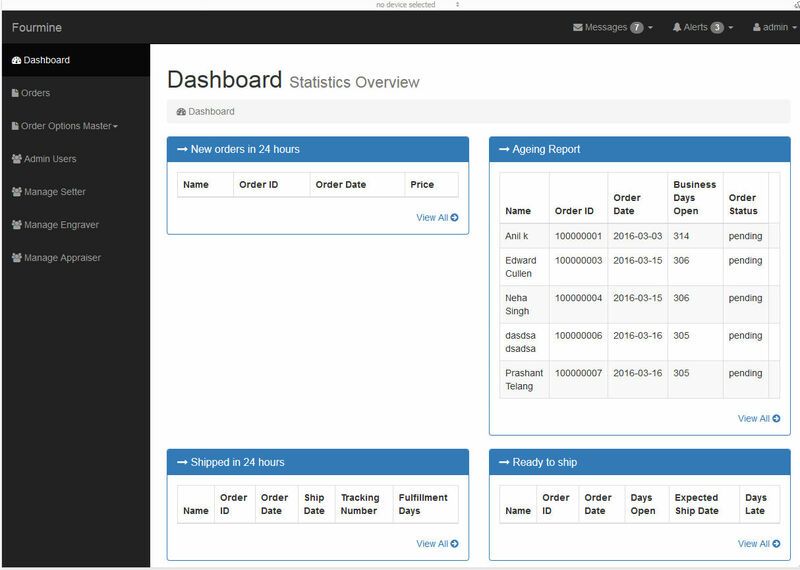 Order data contains order statuses, billing detail, shipping details, payment details, Product Details and Order total details etc. SOAP API can be used to retrieve and update data using its available Methods. 1. Savings in time, man hours and cost through online tracking of the orders and effective co-ordination between various stakeholders. Thus, jewelry business gets managed easily, quickly, accurately & efficiently which results into increase in productivity and profitability. 2. Recording and storing of valuable information related to orders, customers, suppliers and other entities.